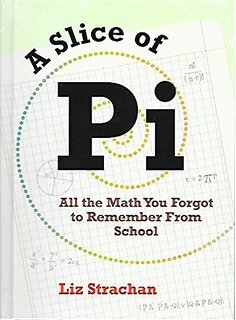 If you love math, you’ll love A Slice of Pi – All The Math You Forgot To Remember From School by Liz Strachan. It’s a great little reference book full of short vignettes and explanations on different historical references, famous theorems and proofs, and interesting explanations. Strachan discusses topics that include: Fibonacci, Euclid, Binary Numbers, the Pentagram, Triskaidekaphobia and of course, Pi! I commend Strachan for composing such an approachable and light-hearted anthology. Each topic is at most a few pages long, so it’s easy to read a section or two at a time without getting overwhelmed. She includes real stories from her teaching days, including some of the student reactions that make her stories come to life. Strachan is also clear in her mathematical explanations, which makes this book easy to follow. A Slice of Pi will grace my bookshelf both in my office and in my home for years to come.